Bowls of this type are known as 'marriage' bowls, and with their carefully chosen auspicious decoration, were popular in Qing dynasty China. The present bowl is exceptional for the translucency of its stone, one of the fundamental qualities which the Qing carvers sought to emphasize. The thinness and height of the side walls successfully achieve this goal, bringing the quality of the nephrite's translucency to the fore, so that it becomes the dominant feature of the vessel. Carved decoration has been confined to the mouth rim and handles, but deliberately omitted from the main body so as not to detract from the colour and quality of the stone. A number of smaller vessels sharing with the present example the shallow, flat-based form and elaborate protruding handles from which loose rings hang, have been preserved in the Imperial collection of the Palace Museum, Beijing. These vessels are usually described as brushwashers; cf. Zhongguo Yuqi Quanji, vol. 6, nos. 314 and 316. 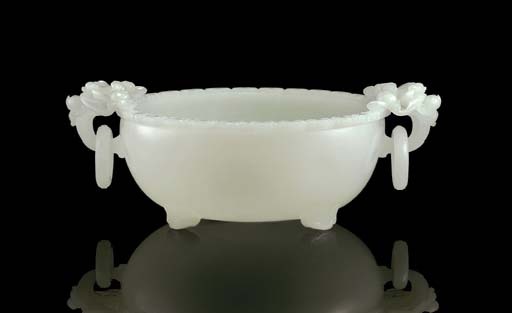 Compare also an exceptionally large white jade marriage bowl with plain sides, sold in these Rooms, 26 April 2004, lot 1226. The everted lingzhi band at the mouth rim of the present lot is also found on two covered bowls in the Palace Museum in Beijing, illustrated in Jadeware (III), The Complete Collection of Treasures of the Palace Museum, Hong Kong, 1995, pls. 197 and 198. The carved elements on the marriage bowl comprise of various auspicious greetings, as is often the case for bowls of this type. The pair of bats on the handles are a common motif as the pronunciation for bat, fu, is a homophone for 'blessings' or 'good fortune'. The lotus is another popular design that is associated with Buddhism and represents purity and harmony. The ruyi, which is depicted on the mouth and feet of the vessel, is also associated with good fortune as the name means 'as you wish'.